The preservation and dedication of passionate individuals who dedicate their lives to wildlife conservation are ambassadors for their chosen species. 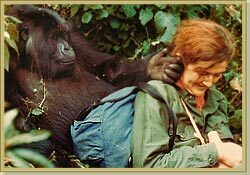 Dian Fossey was one of these wildlife ambassadors. Born in San Francisco in 1932, her interest in animals took hold at a young age. After a friend’s visit to Africa piqued her interest in 1963 a new era in her life would begin. That same year Dian took out a three year bank loan and her entire life’s savings and travelled to Africa. The last two sites on her trip were Olduvai Gorge in Tanzania (then named Tanganyika) and Mt. Mikeno in Congo (then named Zaire), where in 1959 American zoologist George Schaller carried out a pioneering study of mountain gorillas. Dian’s visit to Olduvai Gorge would prove to be a pivotal moment in her life. There she met with Dr. Louis Leaky and spoke of Jane Goodall’s work with chimpanzees, then in its third year. Looking around the site she slipped and fell and broke her ankle. With her upcoming climb to see the mountain gorillas at risk she would not be discouraged. She went to Travellers Rest, a small hotel in Uganda close to the Virunga mountain and the gorillas for respite. Owned by Walter Baumgartel, an advocate of gorilla conservation and among the first to see benefits that tourism could bring to the area. Walter recommended she meet Joan and Alan Root, wildlife photographers who were collecting footage of gorillas for a documentary. Accompanying them she saw the precious mountain gorillas and developed a firm resolve to come back and study them. Returning to work in the U.S. to repay her loan she was able to publish a number of articles and photos from her trip. In the spring of 1966 Dr. Leakey’s lecture tour came to Louisville. Dian attended and after was able to speak with Leakey. Showing him some articles she had published he spoke of a long-term field project studying the gorillas and ended by informing her she would first have to remove her appendix. She did. Only to hear later his suggestion was mainly a gauge of her fortitude. Eight months later she was again on her way to Africa. In 1967 Dian established the Karisoke Research Centre, an alpine meadow with a view of the entire Virunga chain of extinct volcanoes. She was faced with a number of challenges, including no interpreter and significantly gaining acceptance among the gorillas in the area. The following year National Geographic sent photographer Bob Campbell to photograph her work. His photos of Dian and the gorillas launched her into instant celebrity and changed the image of gorillas from dangerous beasts to gentle beings and drew attention to their plight and conservation. Dian never felt up to par scientifically because she didn’t feel she had adequate academic qualifications. So, in 1970 she enrolled in animal behaviour at Darwin College, Cambridge, under Dr. Robert Hinde who had also been Jane Goodall’s supervisor. Dian travelled back and forth between college and Karisoke until 1974 when she completed her Ph.D. Though not usually the targets, the gorillas became ensnared in traps intended for animals such as antelope or buffalo. Dian fought poachers and encroachment by herds of cattle through unorthodox methods, such as, wearing masks to scare poachers, burning snares, spray-painting cattle to discourage herders form bringing them into the park and even confronting poachers directly. She referred to her tactics as ‘active conservation’. These methods were not popular among the locals who were struggling to get by. Using her own funds she helped purchase boots, uniforms, food and provide additional wages to encourage the park wardens to be more active in enforcing anti-poaching laws. These efforts initiated the first Karisoke anti-poaching patrols to protect gorillas in the research area. A five year-old gorilla in Group 4 was drawn to Dian and she to him. She named him Digit due to a missing finger. Digit was a part of the photo shoot with Bob Campbell and served as official representative of the Parc des Volcans mountain gorillas, appearing on posters in travel bureaus throughout the world. Tragically on December 31st 1977 Digit was killed by poachers while defending his family. Stabbed multiple times and his head and hands severed, Dian declared war on the poachers. 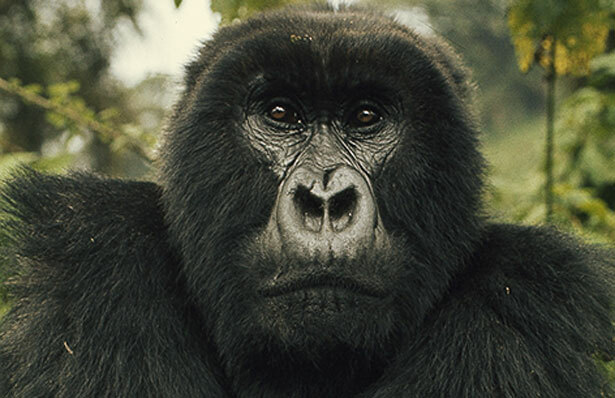 Dian used Digit’s celebrity and death to gain attention and support for gorilla conservation. The Digit Fund (later renamed the Dian Fossey Gorilla Fund International) was established to raise much needed money for her ‘active conservation’ and anti-poaching initiatives. Moving to New York in 1980 as a visiting professor at Cornell University Dian used this time to focus on her manuscript for her book Gorillas in the Mist. Published in 1983, the book is an account of her years in the rainforest with the mountain gorillas. Most importantly, it calls attention to the desperate need for concerted conservation efforts. Not long after her return to Rwanda in 1985, a few weeks before her 54th birthday Dian Fossey was murdered in her cabin at Karisoke. With no evidence of a robbery and no one ever arrested, the case remains unsolved. Dian Fossey was laid to rest in her gorilla graveyard behind her cabin at Karisoke among her gorilla friends and next to her beloved Digit.